On 25 September 2018, the FIFA Football Stakeholders Committee (FSC) approved a landmark reform package of the football transfer system. Representatives from the European Club Association (ECA), World Leagues Forum (representing leagues), FIFPro (representing players) as well as member associations, confederations and the FIFA administration approved in principle a set of recommendations aimed at increasing the transparency of the transfer system, protecting its integrity and reinforcing solidarity mechanisms for training clubs (the Recommendations). The Recommendations will be submitted to the FIFA Council for approval at its next meeting on 26 October 2018. The Recommendations were a result of months of discussions, investigations and negotiations by the FSC. Part of the considerations undertaken by the FSC – particularly in respect of intermediaries - were the findings of the project, ‘Promoting and Supporting Good Governance in the European Football Agents Industry’,by Professor Richard Parrish, Dr. Andrea Cattaneo, Professor Johan Lindholm, Professor Jürgen Mittag, Professor Carmen Pérez-González and Professor Vanja Smokvina (the Project). In August 2018, the Project published an interim report of their findings on the football agents industry, a copy of which can be found here. On 27 September 2018, the Project partners held a roundtable discussion event in London attended by representatives of the members of the FSC, as well as various other actors in the football industry (including the author), to discuss the findings in the Project’s interim report as well as the Recommendations (the Project Event). A brief overview of the reaction to the changes by various football stakeholders, and the next steps. Before analysing the Recommendations, it is worth briefly revisiting the events which have led to this point. On 6 November 2017, FIFA and FIFPro reached a wide ranging 6 year cooperation agreementto strengthen relationships between the two organisations and improve the governance of professional football worldwide. In addition, an agreement was reached by the FSC, which includes FIFA, FIFPro, the ECA, the World Leagues Forum, confederations, member associations and other professional football stakeholders. Among the improvements agreed were several changes regarding dispute resolution between players and clubs (particularly for decisions in cases of overdue payables), as well as new provisions to avoid the abusive conduct of parties (such as players being forced to train alone). As a consequence of these commitments and the implementation of the agreement, FIFPro withdrew its complaint against FIFA lodged in September 2015 with the European Commission.Broadly, the complaint had alleged incompatibilities between the FIFA transfer system and EU law. As part of the settlement seeing the withdrawal of the complaint, FIFA established a Task Force (which is a sub-committee reporting to the FSC) to conduct a review of the transfer system, including the role played by agents/intermediaries in it. The first wave of significant changes were announced by FIFA in April 2018,regarding various amendments to the FIFA Regulations on the Status and Transfer of Players (“RSTP”), notably concerning the execution of monetary decisions, overdue payables provisions, abusive conduct and parameters for player compensation. A new version of the RSTPencompassing these amendments came into force on 1 June 2018. If you would like to know more about those changes and the recently revised RSTP, please see this articleby the author. The Recommendations, analysed further below, can therefore be seen as a second major wave of recommendations from the FSC. This won’t be the last suite of changes either. The announcement by FIFA regarding the Recommendations stated that the FSC “will continue to discuss a series of broader measures for the improvement of the transfer system, including potential changes to the training compensation system.” Accordingly, more major changes can be expected in the future. Solidarity contributions to apply to domestic transfers with an ‘international dimension’. These will be analysed below in turn. A clearing house will be created to process transfers, with the aim of improving integrity in football transfers and transactions and avoiding fraudulent conduct. The clearing house will centralise and be responsible for the payments associated with transfers such as solidarity contributions, training compensation, agents’ commissions and, potentially, transfer fees. The clearing house will be an external financial services company (e.g. a bank) contracted by FIFA and audited by independent accountants. The intention is that training compensation and solidarity contributions will be automatically deducted from transfer payments, and distributed to the relevant training/former clubs based on information contained in the FIFA Transfer Matching System(TMS) and players’ electronic passports. Whilst it will not eradicate fraudulent behaviour altogether, having as much information as possible on the identities of the characters involved and the payments in a transfer should, in theory, help FIFA minimise the risk of (i) money going missing; (ii) not being paid; or (iii) otherwise fraudulent behaviour. In practice, some clubs keep a manual record of their former players’ movements in the transfer market, and often need to chase those players’ new clubs for training compensation and solidarity contributions when they move. This is not only costly, time consuming and inefficient, but also counter-productive to the whole spirit of training compensation / solidarity contributions as the money would often not be paid. It was reported that in 2017, only USD 64m of solidarity contributions were paid, from an estimated USD 318m which was due.Accordingly, in the author’s opinion a mechanism to automatically distribute these payments to old clubs would be a positive change. The author also notes that currently in England, where the author is based, any payments made by a club to an intermediary in relation to a transaction (excluding salary deductions) must be made via a clearing house established by The FA. A similar system both at FIFA and across all national football associations to cover all payments involved in a football transfer would be a positive development. There will be a mandatory introduction of an electronic transfer system (essentially a copy of the FIFA TMS) at national level following the model in place at FIFA for international transfers. It is worth noting that a domestic TMS system is already in place in some countriessuch as the Netherlands. There will also be a domestic electronic registration system. By way of background, FIFA TMS is an online platform designed to ensure that football authorities have more details available to them on international transfers. Additionally, the online system defaults as a database that simultaneously helps increase transparency while reducing the potential for illicit activities such as money laundering. If you would like to know how international transfers are processed through FIFA TMS, please see this article. The implementation of a domestic TMS and registration system in all countries to deal with domestic transfers would aid in transparency, so can also be seen as a positive development. However, how this will be funded and implemented, especially in developing countries will be a key consideration. The most noteworthy recommendation by the FSC is undoubtedly the proposed changes regarding agents / intermediaries. When FIFA introduced its intermediaries regulations in 2015, it made the ill-fated decision to de-regulate the agents’ industry. The potential negative consequences of that decision were widely discussed at the time, and whilst FIFA had its reasons for doing so, it was unanimously agreed by all the stakeholders present at the Project Event that the FIFA Intermediaries Regulations simply did not work. A detailed analysis of the problems which arose due to FIFA’s decision to de-regulate the industry is outside the scope of this article, but inter alia, it led to wildly inconsistent regulations around the world, a significant increase in the number of agents / intermediaries in the market and a corresponding decrease in quality and transparency. The conflicts of interest in the industry were also a strong concern for the FSC. 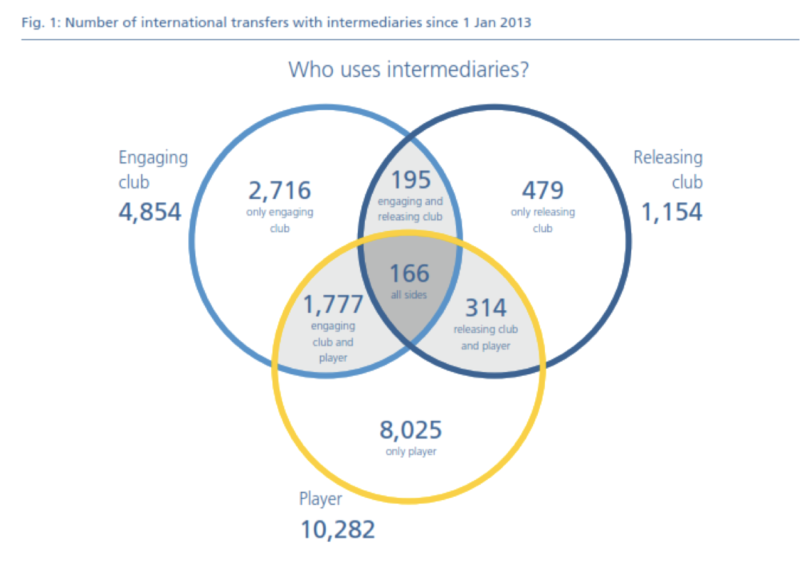 The illustration below from FIFA TMS highlights that in international transfers between 2013 and 2017, there were 314 instances of an intermediary acting for both selling club and player, 195 instances of acting for both selling club and buying club and 166 cases where an intermediary acted for the player, the buying club and the selling club (i.e. triple representation). Those stats are only relating to international transfers, so there is no information or oversight regarding how often that has occurred in domestic transfers. In light of the above, there was a consensus amongst the stakeholders present at the Project Event that the FSC’s proposals for new and stronger regulations for agents and a licensing and registration system through FIFA TMS were a welcome (and much needed) development for the industry. Under the proposed changes, in order to be registered and licensed through FIFA TMS, agents will need to pass an exam as well as periodic continual professional development (CPD) courses. The requirement will be applied across the board, even if the agent is a family member / lawyer / accountant or otherwise. This is effectively reverting to the pre-2015 regulation of agents by FIFA. However, it is notable that FIFA acknowledged that these regulations had in fact failed to regulate all but 30% of international football transactions at the time FIFA implemented the FIFA Intermediaries Regulations. Presumably, at the second time of asking, FIFA are confident that its regulation of agents, in conjunction with a clearing house and global TMS support will prevent a recurrence of the problems of the past. Agents acting for multiple parties in a transaction will be more closely regulated. Traditionally, an agent only acted for one party in a transaction.However, going forward, dual representation may be permissible if the agent is acting for the player and the buying club. Triple representation and player/selling club and buying club/selling club dual representation will not be allowed. Further, a separate investigatory and adjudicatory chamber will be established at FIFA to investigate agents’ misdemeanours, and to sanction them accordingly. Whilst it is envisaged that “strong” sanctions will be introduced, there are no details yet as to what these sanctions will be. The most controversial element of the proposals regarding agents however, is the reference to introducing ‘compensation restrictions’. Whilst a restriction on commission in some capacity has been agreed in principle by the FSC, it is worth noting that it has notbeen confirmed that a ‘cap’ on commission will be implemented. Various models of structuring commission payments are currently being considered by the FSC, and there will be a period of consultation with agents in the industry to negotiate the most appropriate outcome for all parties. Whilst the Task Force have engaged with a selection of agents from around the world- including representatives of the European Football Agents Association (EFAA) - in the lead up to agreeing the Recommendations, it is worth noting that that agents do not have any representation on the FSC. Accordingly, the FSC will likely be closely liaising with agents and the EFAA before finalising any recommendations regarding restrictions on commission. At the Project Event, the stakeholders of the FSC confirmed that the majority of time spent in negotiations and discussions related to the issue of agents, which not only reflects the complexity of the issue but also the importance it has for the industry. The rules on loans will be amended, with the number of loans per season and between each club being limited, as well as a prohibition of bridge transfers and sub-loans. The loan rules will be amended to focus on the development of young players, rather than to serve as a vehicle for commercial exploitation by clubs. The need for a change in the loan rules is ideally exemplified by the following two examples. Firstly, Matej Delac, who was remarkably loaned out nine separate times between 2010 and 2018,and never made a first team appearance for Chelsea before he left the club as a free agent. Secondly, the report shared to the FSC cited an example of a club which had 53 players on loan, with only one ever returning to play for the parent club.It is not difficult then, to see why the FSC wished to change the loan rules. Whilst the Recommendations have not specified the maximum amount of loans that will be permissible going forward, critics of clubs which stockpile talent on loan will welcome these changes. The author anticipates that there would have to be a reasonable transition period to allow clubs to become complicit with the new rules without too much upheaval. The prohibition of bridge transferscan be seen as a reflection of existing decisions from the Court of Arbitration for Sport (CAS). No information has been provided as yet behind the rationale for prohibiting sub loans, though the author suspects this is likely due to a desire to simplify the loan system. The currently solidarity mechanism contained in the RSTP only applies to the international transfer of a player between two clubs belonging to different associations. For example, if an Argentine player was to transfer from a club in Argentina to a club in Portugal, solidarity contributions would be payable. If that same Argentine player later transferred to another club in Portugal, no solidarity contributions would be payable to the Argentine club due to a lack of an international transfer (even though there is an international dimension). There are rules in various countries around the world entitling clubs in their jurisdiction to solidarity contributions in domestic transfers, however this is not uniform across the world. This rule will be amended, such that solidarity contributions will also apply to domestic transfers with an international dimension, such as the example cited above. This rule change could potentially be beneficial for many clubs in countries famed for developing talented players such as South America, Africa and Asia in particular, whose players may move to Europe at an early age, then move around to different clubs within that same association. The ‘international dimension’ of those domestic transfers would still entitle those training clubs to solidarity contributions. To illustrate how this rule change could impact training clubs, when Virgil van Dijk moved from Southampton to Liverpool, no solidarity contribution would have been due to Willem II or Groningen. Similarly, when Sadio Mane moved from Southampton to Liverpool, no solidarity contributions would have been paid to Metz or Red Bull Salzburg. Under the new rules, all those training clubs would have received solidarity payments for those domestic transfers. Whilst the Recommendations are, on the whole, positive developments for the transfer system and we await further details as to how the Recommendations will be brought into force, at this early stage the author considers that there are some issues worth monitoring going forward. The restriction on agents’ commission will undoubtedly be the most heavily scrutinised rule change by the FSC. Part of the rationale for considering placing restrictions on commission was the fact that the amounts of commission paid to agents are far in excess of the amounts being paid to clubs for training compensation and solidarity contributions. It was noted at the Project Event by FIFA that the commission paid to agents in a specified period was more than 6 times the amounts paid in solidarity contributions to clubs, and more than 22 times the amounts paid as training compensation. At this point, it’s worth noting that the basis of the complaint which FIFPro filed at the European Commission was that the transfer system was in violation of EU law. One of the main reasons why the transfer system is permitted under EU law is the existence of training compensation and solidarity contributions. The FSC believes that clubs have lost faith in the system of training compensation and solidarity contributions, and there is a sentiment that the transfer system currently exists largely for the commercial benefit of agents. It is easy to see why, when training compensation and solidarity contributions payments are dwarfed by the commissions paid to agents. If the system of training compensation and solidarity contributions is broken, the entire transfer system may then be in violation of EU law, hence the desire to restrict commissions paid to agents. Conversely, agents argue that the failings of the training compensation and solidarity contributions system are not the fault of agents – so restricting agents’ commission is not an appropriate solution. Nevertheless, a restriction on agents’ commission has been agreed in principle by the FSC. As noted above, the exact manner in which commission will be restricted is still to be determined, but a ‘cap’ is indeed being considered. The existing FIFA regulations contain a ‘recommendation’ of a commission cap of 3%, however in practice it is hardly enforced. If a fixed commission cap is enforced going forward, this could be problematic for a number of reasons. Firstly, it is not without its legal issues. Whilst outside the scope of this article, it may be the case that a commission cap could amount to a violation of EU law.Indeed, the Association of Football Agents (AFA) filed a challengeat the European Commission back in 2015against the ‘recommended’ benchmark cap – let alone a mandatory fixed cap - contained in the present Intermediaries Regulations. Agents argue that there is no justification, either commercially or under EU law, for the introduction of a cap. The potential for a lengthy legal dispute over a commission cap is something all parties are acutely aware of, so it would not be a decision taken lightly by the FSC. Indeed, as agents are not a member of the FSC, FIFA has stated its intent to closely consult with agents prior to introducing any restrictions on commission – whether that be by way of a cap or otherwise. Secondly, there is the question of whether a cap of 3% (which the figure being mooted), is fair for the services provided by agents. Agents have noted that caps – if any – in other equivalent industries are set at a much higher rate than 3%. Thirdly, and perhaps most importantly, the imposition of commission cap could perversely have the opposite effect to the FSC’s intention to make the industry more transparent, as it may likely result in these payments being driven under the table. Agents - and indeed clubs who are focussed on getting their preferred player(s) – will likely find creative ways to circumvent the cap. Throughout the industry, there are examples of agents and clubs entering into ‘scouting agreements’ which are simply vehicles for disguised remuneration, as well as convoluted international structures whereby agents are indirectly remunerated by clubs through a series of company loans, consulting agreements and the like. These mechanisms are very difficult to monitor/regulate by authorities. Accordingly, a delicate balance will need to be struck by the FSC on this issue. This is certainly an issue to follow closely over the next few months. As noted above, FIFA will look to establish an investigatory/adjudicatory chamber to regulate agency activity. Details about the composition, structure or powers of the investigatory chamber are still to be discussed/determined. Nevertheless, an effective enforcement system is essential because rules, no matter how well drafted or well intentioned, are only useful if they are enforced effectively and fairly. The concern however, is that for an investigatory chamber to be truly effective in regulating agents around the world, it would need to be a very large department with wide reaching powers, which would in all likelihood be extremely costly. Agents operate in a transfer market where competition for talent is fierce, the landscape is very international, but also simultaneously poorly regulated and enormously lucrative. For these reasons, it has, unfortunately, attracted its fair share of unscrupulous characters, indulging in underhanded and even illegal behaviour. Will an investigatory chamber based in Switzerland be able to detect instances of triple representation where for example, the player is from Africa, moving from a club in Asia to the Middle East, with a South American agent? Or where an agent is indirectly paid commission by a club through the guise of consultancy agreements, and/or company loans from companies based in the British Virgin Islands? What about domestic transfers which are not on FIFA’s radar? Will an investigatory chamber be needed at a domestic (or perhaps confederation) level? That would be even more costly. The above is not to say that an investigatory chamber would not be useful – indeed a strong disciplinary system is absolutely essential and in fact, this proposal appears to have been welcomed by agents. However, the true effectiveness of an investigatory chamber will depend on, amongst other things, the investigatory powers it is granted and the amount of resources it has at its disposal. So, it will be interesting to see how this investigatory chamber is ultimately structured. Whilst not as significant a concern as a potential commission cap or the enforcement system, basing the automatic payments of training compensation and solidarity contributions on electronic player passports could also be a slight cause for concern. There have been some instances, most notably from players from Africa or Eastern Europe, where players somehow have multiple – and conflicting – Player Passports.Accordingly, if the clearing house and automatic payments system will be based largely on information contained in Player Passports, FIFA will need to take steps to ensure the integrity and reliability of those Player Passports. FIFA might look to integrate this with FIFA TMS’s Global Player Exchange (GPX). Overall, the Recommendations made by the FSC are a positive development in the reform of the transfer system. Of course, the devil is in the detail, so it will be interesting to review the final regulations which are implemented over the next few years. The issues identified in this article, in particular the proposed cap on agents’ commission, will be worth keeping an eye on. Regardless, it is noteworthy that the FSC is adopting a holistic approach to revising the transfer system. Rather than looking at individual elements of the system (such as agents or training compensation) and trying to regulate it in isolation, the FSC is proceeding on the understanding that each element of the transfer system is interlinked in a complex ecosystem. Fixing one problem may indirectly cause another,so it is taking a big picture approach with a focus on improving the transparency of the system, integrity of the sport and the protection of players and clubs. Lastly, it is particularly encouraging to see the level of collaboration and co-operation between various stakeholders in football for the betterment of the game. FIFA were pleased to support this event and provide more opportunities to explain recent developments and our ongoing work. We welcome the opportunity to meet with more of our stakeholders and hear their experiences and perspectives of working in international football. The ECA will continue to engage with fellow stakeholders through FIFA’s structures to modernise the transfer system, in a manner which protects the principles underpinning the 2001 agreement, namely to find the right balance between freedom of movement, contractual stability, and rewarding, incentivising and protecting training clubs, whilst ensuring the continued protection of the integrity of competitions. By bringing different key actors of the Game together, today's round table served as an ideal platform to discuss, in a practical manner, the legal implications of the recent changes to the Transfer System. EFAA welcomes the initiative of Edge Hill University and its partners. The meeting in London illustrated that stakeholders are apt to properly discuss the important issues connected to re-regulation of the agent profession. EFAA is confident that an official recognition by FIFA will not only empower agent representation, but, as a consequence, also contribute to solid negotiation results that are able to survive legal scrutiny. FIFPro welcomes most proposals and endorses the recommendations of the Project. In the further elaboration of the plans, FIFPro would like to see a clearer plan for the protection of players next to the protection of minors. Our project is aimed at providing an evidence base to inform the work done by FIFA and the football stakeholders regarding the regulation of football intermediaries. Our Interim Report provides a comprehensive picture of intermediary regulations in force across all Member States of the EU. To take the Report further, we are organising a series of workshops to discuss the key findings and recent developments in the industry. Our first, at Russell Square in London, highlighted restrictions on intermediary remuneration and dual representation as the two most controversial issues with changes to intermediary licensing and education being widely welcomed. We will be holding further events across Europe, starting in Madrid and Cologne, Malmo and Rijeka in the first half of 2019. A final conference will be held in London in November 2019. These events, and the project generally, have received generous support from the EU’s Erasmus + Programme. The Recommendations will now be submitted to the FIFA Council at its next meeting on 26 October 2018. If approved, that policy document will then be the basis for continued negotiations to ultimately turn the relevant principles into concrete regulations to be drafted in collaboration with the FSC. The author understands that the main changes are not expected to be implemented until at least the 2021/22 season, although it is possible that some of the smaller changes could be implemented earlier. Gabriele Marcotti, ‘Revealed: FIFA wants to fix transfers, deal with shady agents and address the loan system. Here's how.’, ESPN, 20 September 2018. Intermediaries in International Transfers, 2017 Edition, Period Jan 2013-Nov 2017 (FIFA TMS 2017), p. 2. However dual representation has been permitted in some countries under the former agents’ regulations and als the intermediaries regulations, subject to consent by all parties to the transaction. This could potentially amount to, inter alia, price fixing or an abuse of dominant position which would be anti-competitive and therefore unenforceable. For example, when FIFA made the decision to de-regulate the agents industry in 2015, at around the same time it also separately decided to prohibit Third Party Ownership (TPO). Those simultaneous decisions, whilst arguably justified in their own right, may have resulted in TPO practices being re-directed through intermediary activity (which was then only very loosely regulated). Very Good Article. Well done.